After a hectic trip it was nice to have a relaxed time in a park, and Bakken fit that bill, with nine hours time to enjoy the attractions (and, more specifically, the free beer provided within the bounds of Rutschebanen). The highlight of the day was in fact this ride, or rather a full speed run full of club members in which the brakes were applied in as sparing a fashion as possible. Perhaps the most telling point about the ride was the fact that the on ride photo system completely failed to capture the train except for the back car, which appeared in the space normally reserved for the front of the train! The rest of the day was spent making relaxing laps of the park, occasionally sitting down for a while, occasionally trying different rides. The fun house was particularly enjoyable, and the double shot has to have been the best ride in the park. 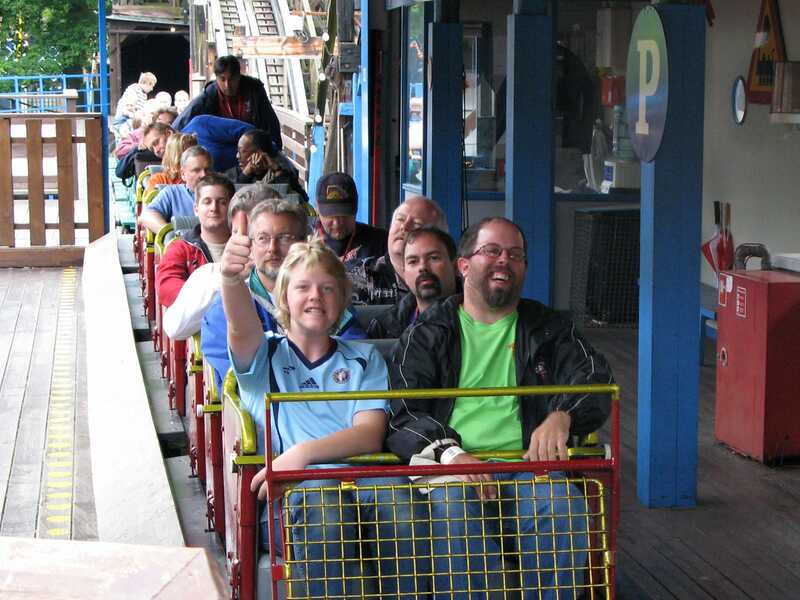 The only downside was another instance of dumb rules; there was a minimum requirement of two people per car on Racing, and even when it became completely obvious that two of us could not fit comfortably the park insisted anyway, the net result being that some people simply could not ride. 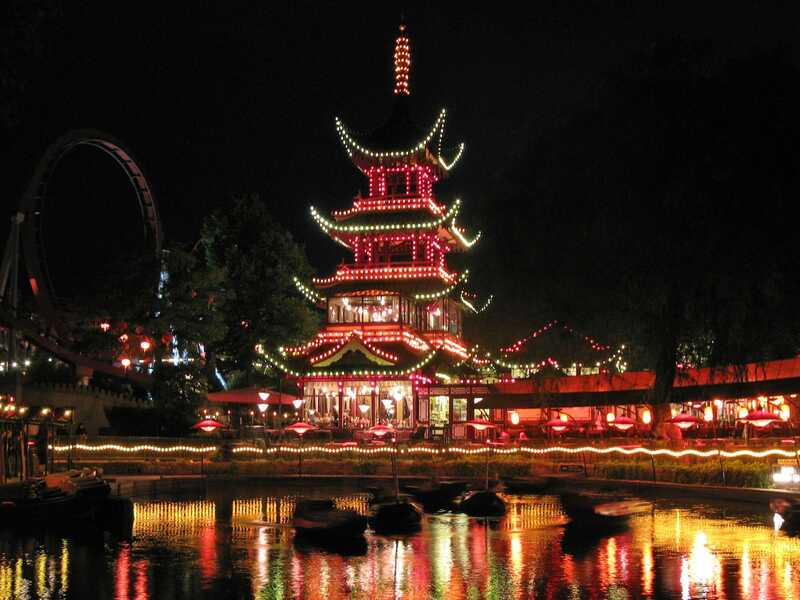 My second evening in Tivoli Gardens began in a rather unusual fashion, namely with dinner. This turned out to be far more time consuming than expected; the park Chinese is very good indeed, but speed is not one of their strong points. On the plus side we had a clear view of the drop tower ride for our meal, and it was amusing to identify club members riding it. There was a dead giveaway; instead of holding on, club members typically stretch out their arms and legs awaiting the drop! When we finally escaped food, we worked our way around some of the lesser attractions in the park, preferring to leave coasters for the ninety minute exclusive session that was scheduled to begin at midnight. The fun house was, quite frankly, a let down following the ones experienced earlier in this trip, though it was probably more suitable for a younger audience in that patrons could stay there as long as they wanted to. The classic inverted flying carpet ride is truly special; I wish these were to be found in other places. The two dark rides can only be described as odd. During the exclusive session people moved between rides, meaning that there was basically no queue anywhere. Two rides on the Star Flyer were quite enough; it was bloody cold up there after midnight. I much preferred to pass the time alternating between Rutschebanen and Daemonen, though there was still ample time to enjoy the Bumper Cars. The park boss appeared towards the end of the session, marking the first time I've seen someone ride bumper cars in a suit!